The sun comes out and suddenly Portland just bursts to life and the list of things to do seems to be never ending. We are already making our Spring, Summer and even Fall bucket lists and I’m not sure how we are going to fit everything in! There are a few noteworthy events coming up that I thought I would share. 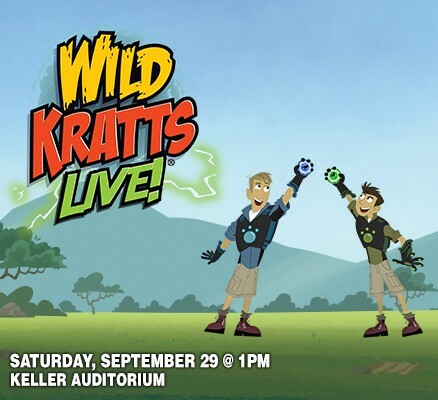 The first of which is Wild Kratts Live! I can’t even fully express how excited I am to take my two oldest to to see Chris and Martin live and in person at Keller Auditorium. 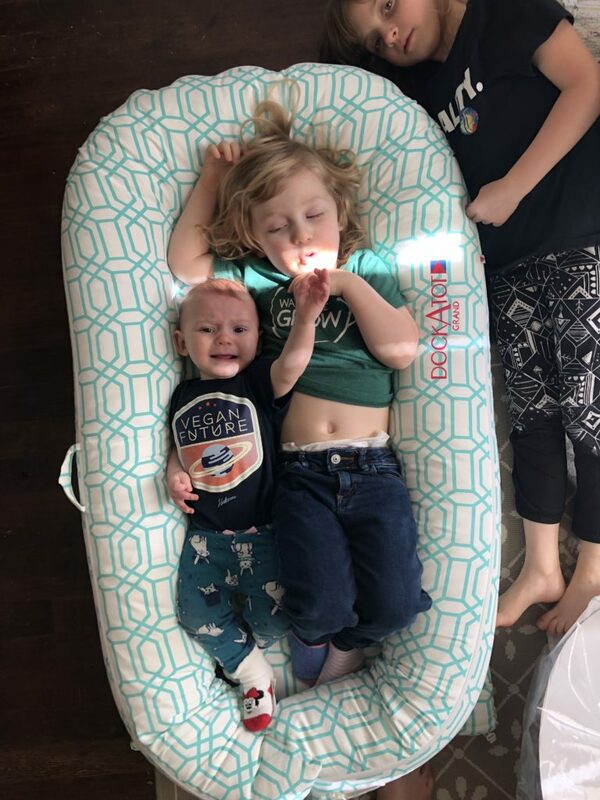 Currently if my kids aren’t watching Wild Kratts they are pretending to be Chris or Martin or Zoboo (from the Kratts late 90’s/00’s show zoboomafoo); it is Wild Kratts all day every day around here. The show isn’t until September 29, 2018 but tickets go on sale Friday, April 27, 2018 at 10am. I can’t wait to get our tickets and to surprise Edith and Alder! 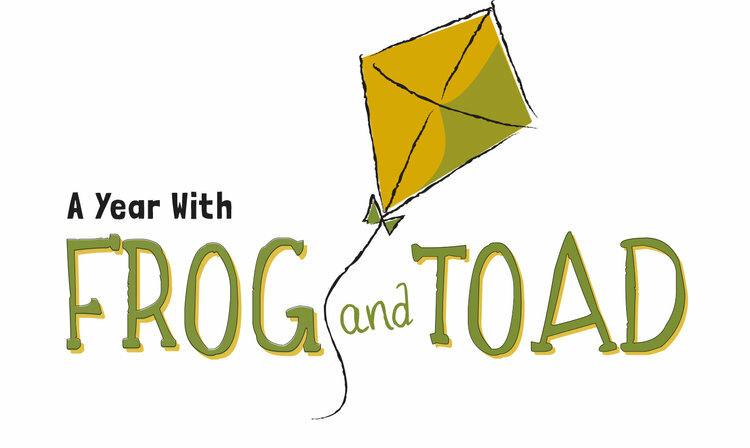 Another event that I might be more exited about than my kids is A Year With Frog and Toad at the Oregon Children’s Theatre. I spent much of my childhood reading about Frog and Toad and so they hold a very dear spot in my heart and memories. I am thankful that Edith and Alder are both finding their love for Frog and Toad as well. we just purchased our tickets and can’t wait to see it! This one I am excited to share but so sad that we won’t be able to attend [insert crying face]. Red Yarn has come out with another incredible album and will be having a big release party/performance at the Aladdin Theater this Saturday, April 28, 2018. We are wishing Andy, Ms. Jesse and The Critters all the best and can’t wait to see the album preformed live. 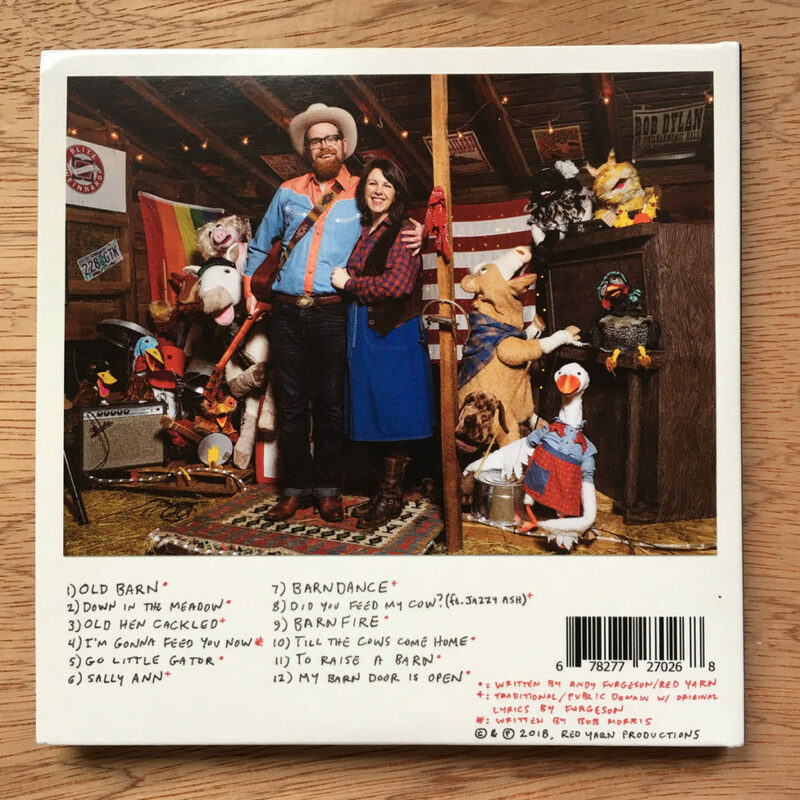 If you can’t wait to see the songs preform you don’t have to check out Red Yarn’s newest music video Barn Dance from his newest album Old Barn. What events are coming up that are on your bucket list? The first time we stumbled upon Olympia, WA was after a last minute trip to Seattle to visit dears friends who were visiting from Germany. We were making our way back home when we decided that we all needed a break from being in the car as well as some dinner before we finished our trip home. We were clueless as to where to go so we headed to the downtown area and found a beautiful park on the water to play at for a bit. We then made our way to a mediocre restaurant that caters to children so of course Edith asks to go there often. After this stop our interest was sparked and we knew we would have to return again. Since this trip back in 2015 we have been back a handful of times including two weekend visits, our most recent this past February. 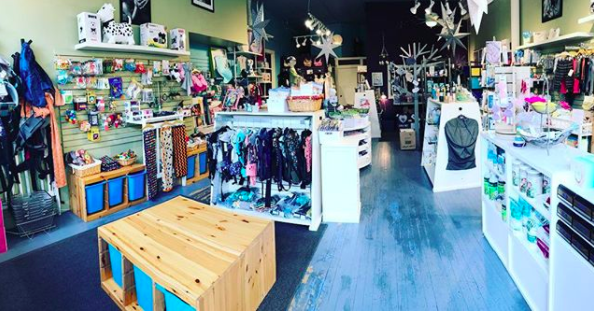 Olympia is two hours (including a potty break) north of Portland and it is the perfect spot for a weekend getaway. I know for most Portlanders a weekend away is usually west to coast, east to the gorge or we completely pass over Olympia and head straight to Seattle but Olympia is filled with so many gems from an amazing children’s museum, great places to eat, nature to explore and one of the best toy stores in the PNW. On our latest trip we stayed at the Hotel RL which is set up on the hill overlooking Capitol Lake. It has generous sized rooms with microwaves and a mini fridge which are essentials when traveling as a family. In the summer there is access to the outdoor pool. On the agenda for our getaway was coffee, nature, and the toy shop. We headed to Olympia on Friday afternoon once Neil was finished up working. We arrived fairly late in the evening so after checking into our hotel and getting some wiggles out we headed to dinner. We ended up eating dinner at a local brewery that was just meh. First priority after a hotel sleep with three kids was coffee from Olympia Coffee Roasters aka the best coffee in town. They also make a really great kids hot chocolate and have some tasty looking baked goods. We opted for breakfast at Hart’s Mesa a little breakfast/brunch spot that has a great menu including a vegan specific menu. 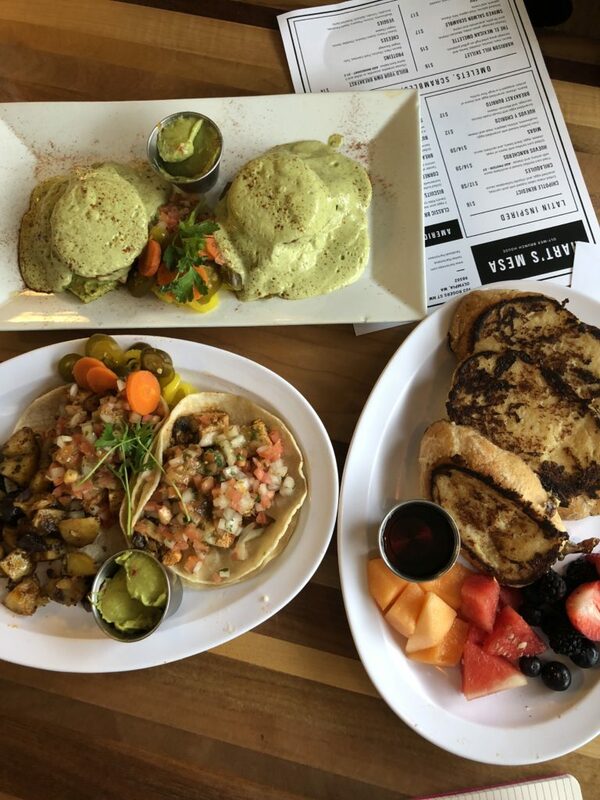 We ordered the taco special, the vegan benedict and the kids shared the vegan french toast with fruit and a side of toast. 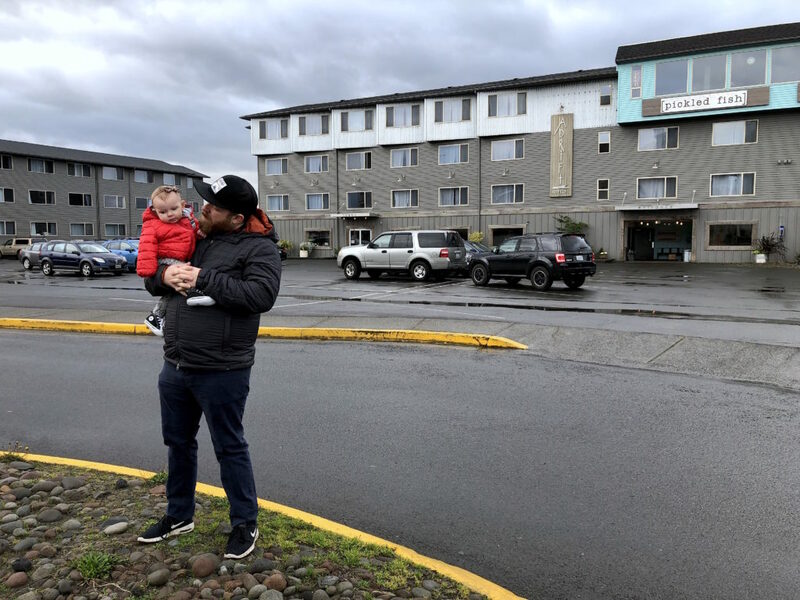 Once our bellies were full we headed to Squaxin Island Tribe Museum Library and Research Center only to find that it was closed due to electrical issues. 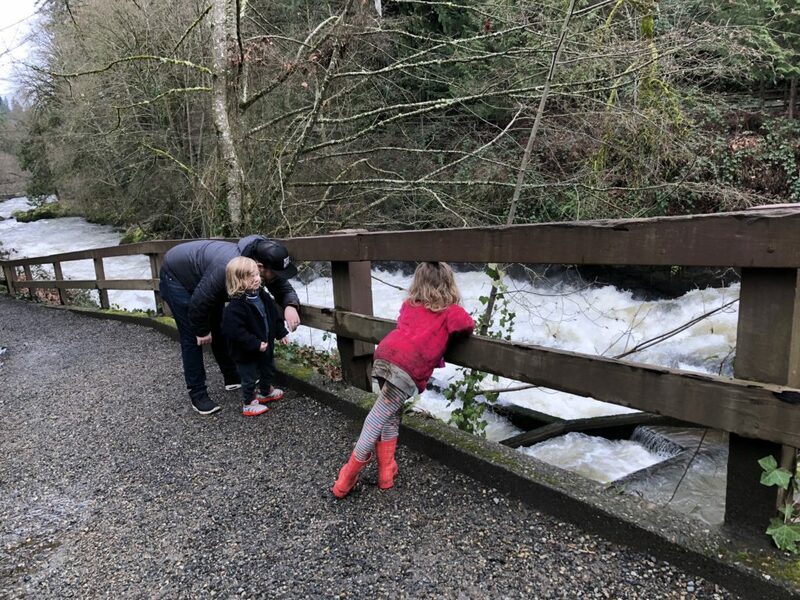 We ended up walking the property for a bit before heading to Tumwater Falls Park where we watched the rushing water of the falls and then walked the 0.6 mile loop making a number of stops along the way to check out waterfalls, plants, and the original power plant location. While the loop was short it took us over an hour to do with all the stops to explore and play. 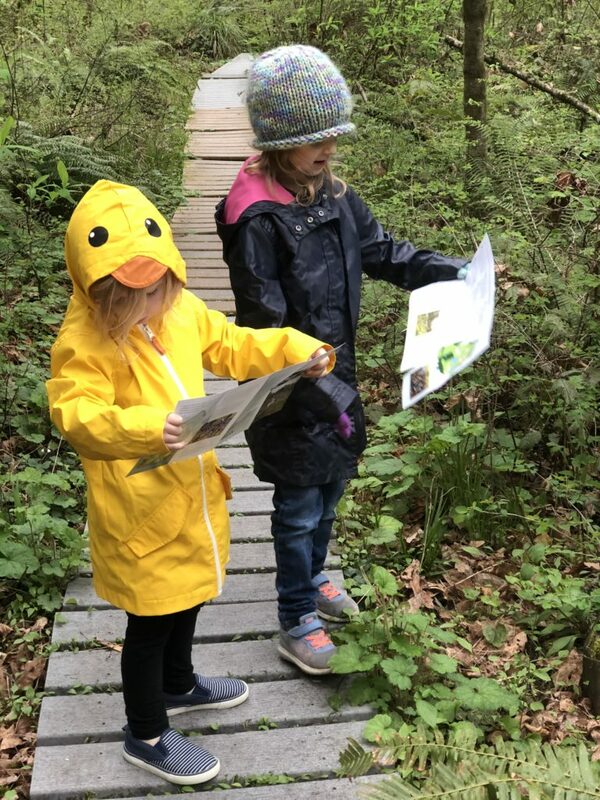 We were all surprised just how much we enjoyed this little nature excursion and we almost passed on it to return to Billy Frank Jr. Nisqually National Wildlife Area (another great spot). After our morning out we headed back to the hotel to relax for a bit and instead of eating out we snack on our stash of food at the hotel [editor: is this correct? i couldn’t recall going out to eat]. 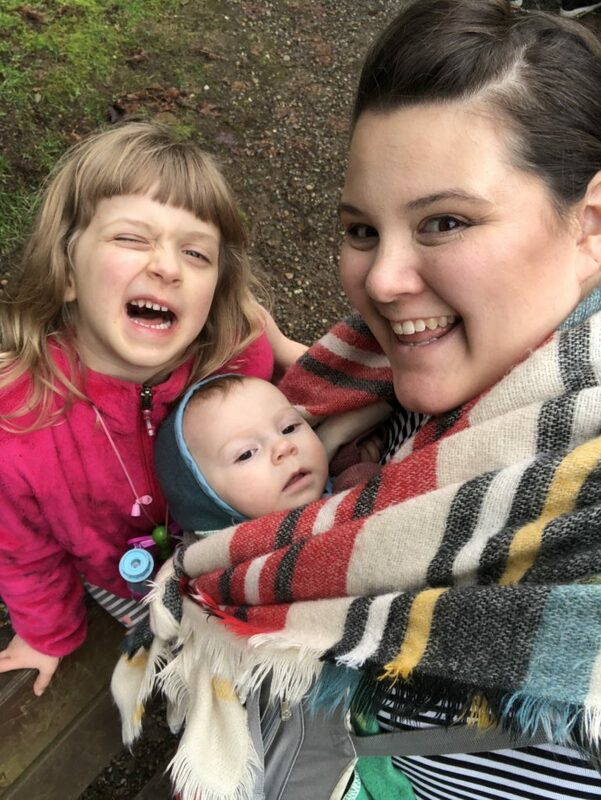 Once we had a bit of down time we decided to head a bit further north to Tacoma to get in a car nap for the littlest two and for all of us to get in bit more outdoor play and dinner in Tacoma. More on this in a future post. The main thing on the agenda for the day was our promise to the kids that we would go to the toy shop. Since it was a Sunday and the toyshop still had a few hours before it would open we first headed to Zoe Juice Bar for a green juice and acai bowls. 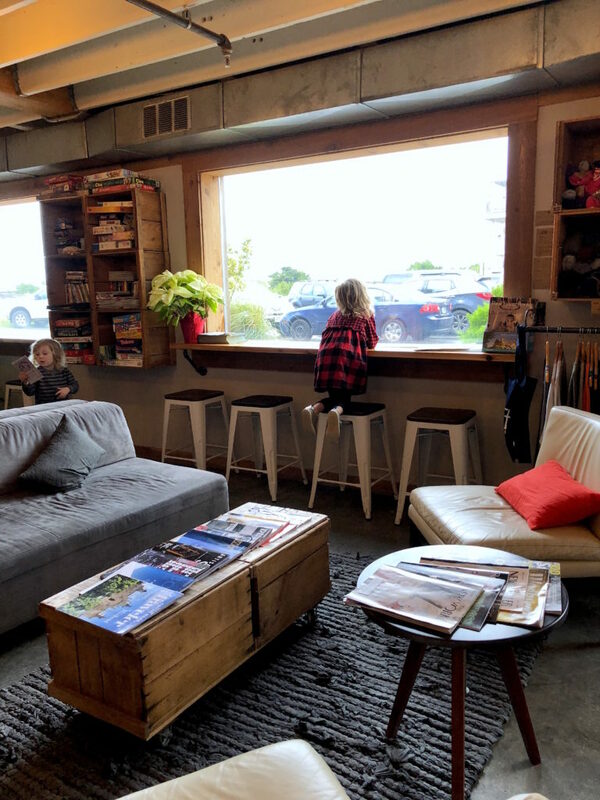 We then fueled up at Olympia Coffee Roasters before finally heading to what I consider one of the best toy shops in the PNW – Captain Little. What makes it the best? 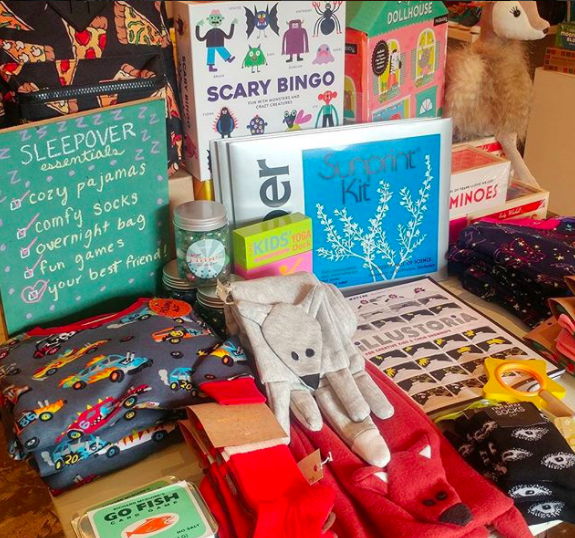 It’s one of those toy shops that is just beautifully curated and filled with beautiful books, toys and gifts. It’s a spot where I could send grandma to pick out a gift and I would be happy with most anything there. 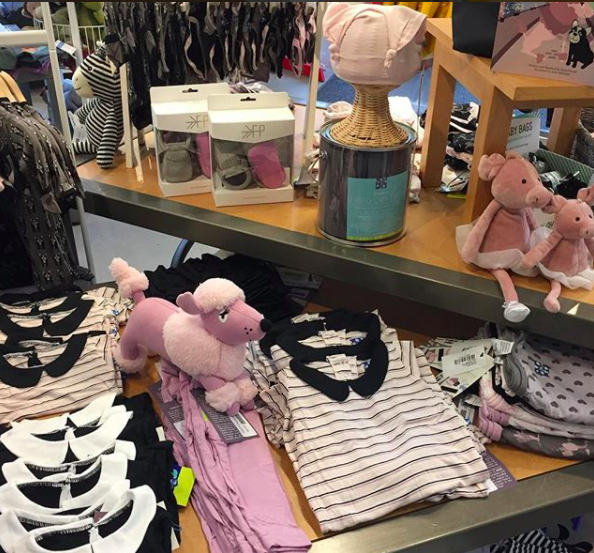 I find myself flitting around the shop picking up toys and such, making note of things that would be good for gifts. The kids however beeline straight to the train table and the vintage robot that you can take a seat in. After our morning out we had hoped to go to lunch at Little General Food Shop but they were having a special brunch so we picked up the very last tempeh sandwich from the cooler and then headed over to Olympia Co-op to pickup some additional provisions to eat at the hotel before starting our drive back to Portland. Below you can find links to all the places mentioned in this post. Also stay tuned for additional guides to Olympia, WA. Usually, when we think of a beach vacation there’s lots of sun and maybe a cold beverage that comes with a little umbrella. That is all wonderful but what happens when your beach day turns from fun in the sun to dreary and filled with rain? You know those little ones who were promised a beach day are going to be heartbroken if you don’t go. 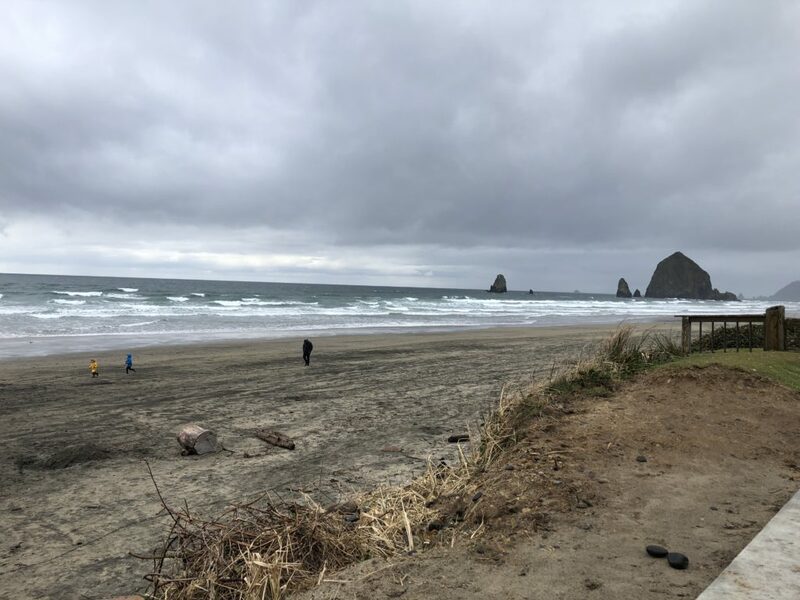 So, rather than scrap the beach all together here are 5 things that will help you make the most of a rainy day at the beach. Rain Suits and Boots. Unless it’s one of those warm summer rain showers you will likely be forgoing the swimsuits for something a bit warmer. Start with an outfit that’s appropriate for the season and then top it with a rain suit, slip on some boots and thank me later. This will help to keep your kids dryer, warmer and it will prevent all that wet sand from sticking to every crevice of their body. 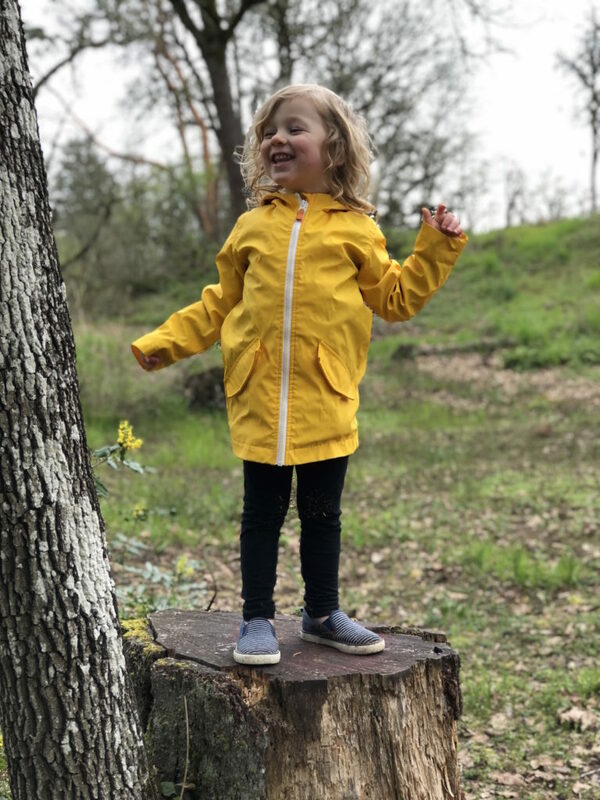 Psst, don’t forget to you set yourself up with a rain suit/jacket of your own. Sand toys, buckets and magnifying glasses. 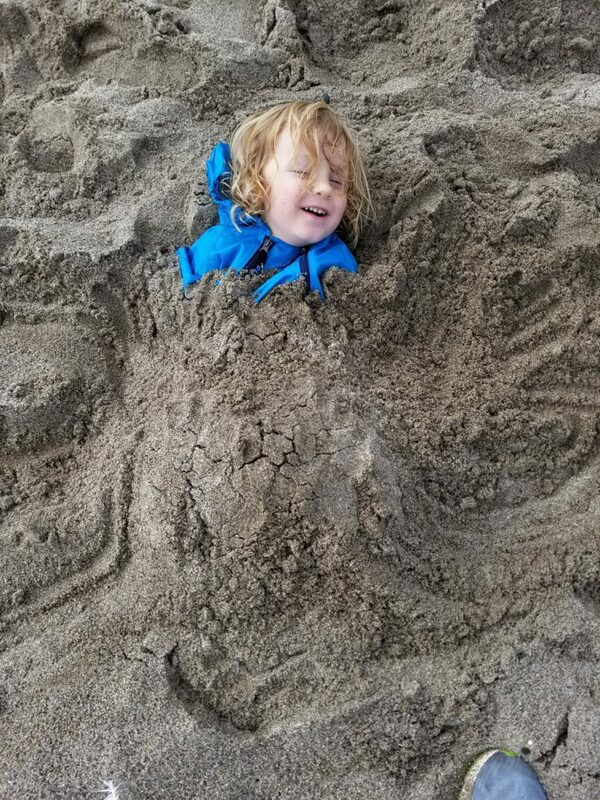 Swimming is likely out of the question so the next best thing is building, digging and exploring the beach. Buckets can be used to build sandcastles or to collect shells and other beach finds. 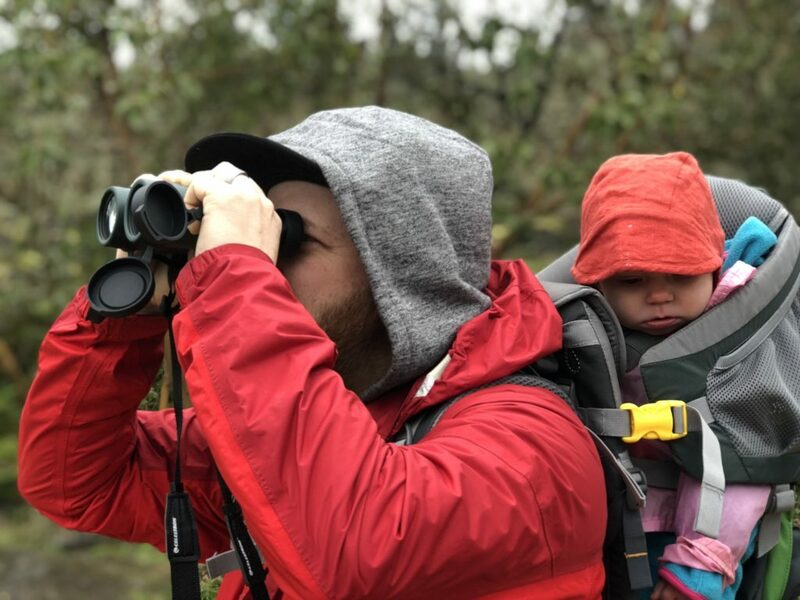 Magnifying glasses will help you and your little one to get a closer look at their beach finds, tide pools or simply to get a closer look at the sand. Also a kite is always a great addition to a windy, overcast beach day. Extra Clothes and diapers/underwear. I know that this sounds obvious but I don’t know how many times we have gotten down to the beach and forgotten to bring extra clothes. 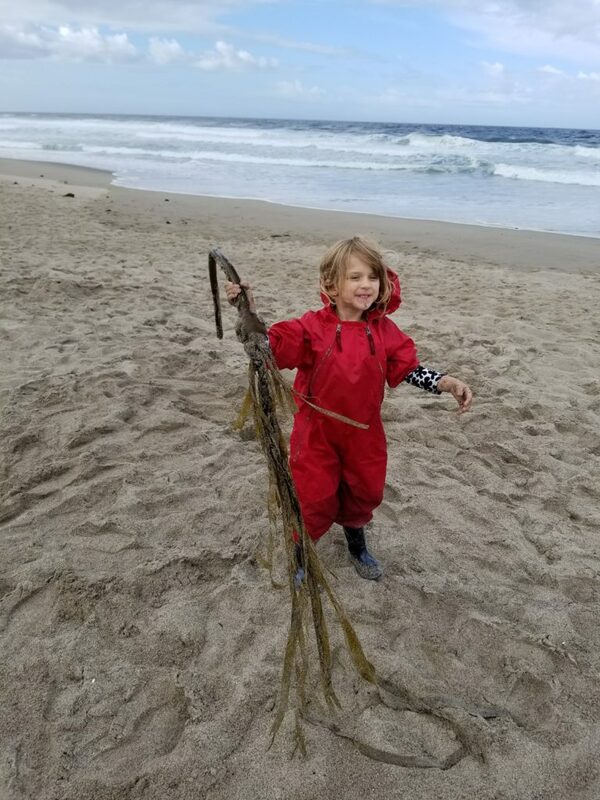 While those rain suits are helpful your kids may find themselves in their rain suits “swimming” in a pool of water they found on the beach and require a change of clothes. Bottles of water for hands and toes. This doesn’t have to be any special water but straight from the tap. Collect some water before heading out and have it on hand to wash away sandy fingers and toes. Oversized Beach Towels. Even without going into the water everyone is bound to get a little wet so towels are a must (and something I seem to always forget). 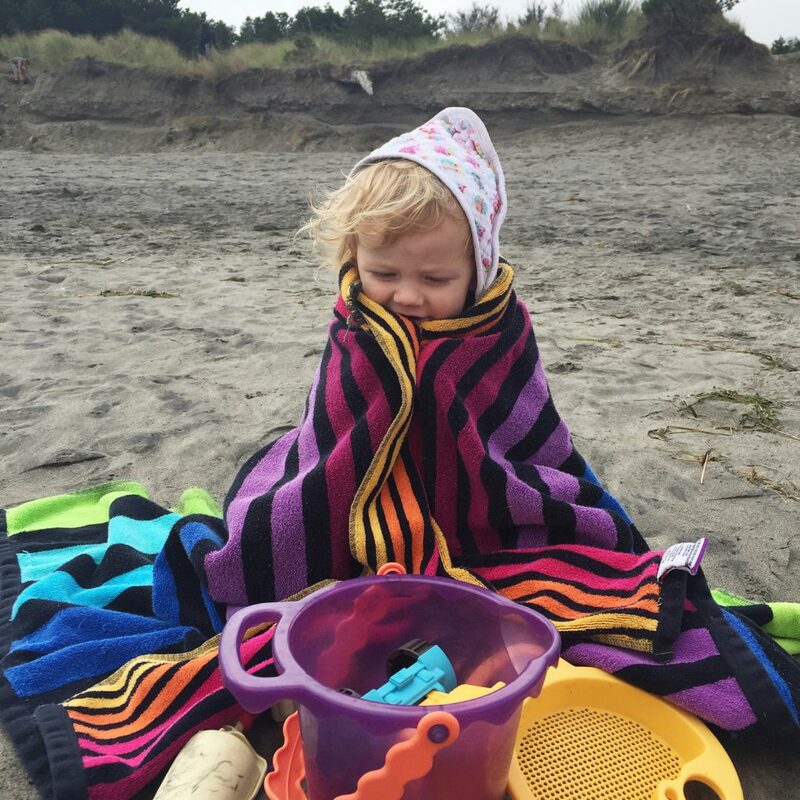 Also you just might end up with a little one who isn’t so keen on playing on a windy and/or rainy beach day and a big towel is the perfect place to hide. 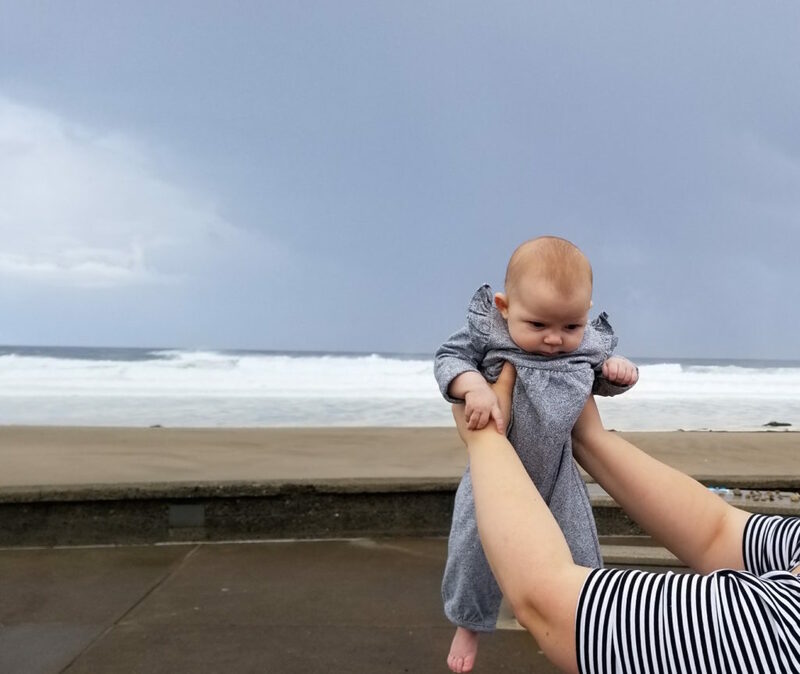 What are you rainy/overcast beach day essentials? The days are long and hard but are also flying by so quickly. I often feel that I am just trying to make it through the day. Living so many days in survival mode and simply going through the motions. Days like these often start and end cranky. The only goal of the day is to make sure everyone is safe, fed and in bed by 7:15pm. 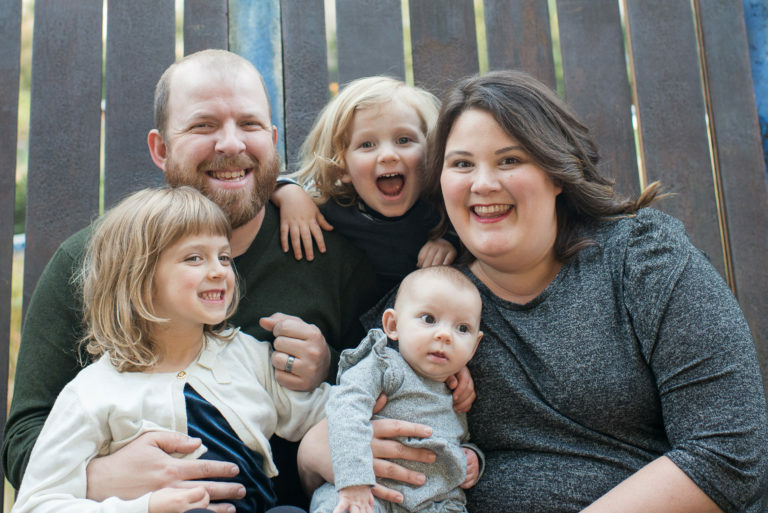 When survival mode hits I stop speaking kindly to myself, my husband, and my kids. I spend my days stressed out and my nights beating myself up for feeling like I’m failing at parenthood. I forget to breathe, forget to smile, forget to slow down and enjoy life. it’s time to stop surviving and start thriving. it’s time for creative play. it’s time for kind words and lots of laughter. it’s time to be present. it’s time to ask for help. it’s time to savor the moments and make memories. it’s time to feel lighter and less burdened. The children’s book obsession is so real at our house and I am constantly finding myself looking for new books to add to our ever growing list of books. We easily take out 20-30 books from the library each week reading them over and over again until they are due back – or lets be honest until we owe fines on them because I am the worst at renewing/returning books. These days I find most of my book recommendations from Instagram and while I have a number of accounts I follow here are a few that I am loving right now. 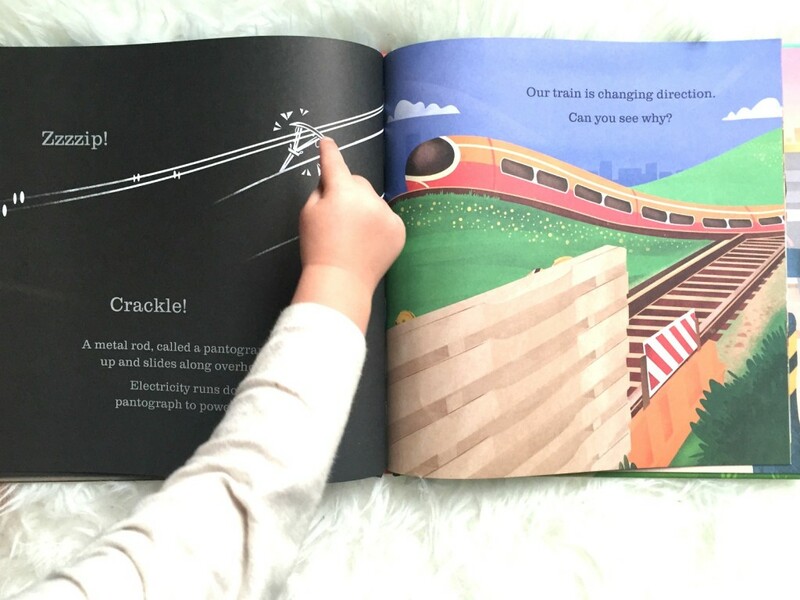 @readingisourthing | Reviews and book lists featuring picture books and middle grade books. 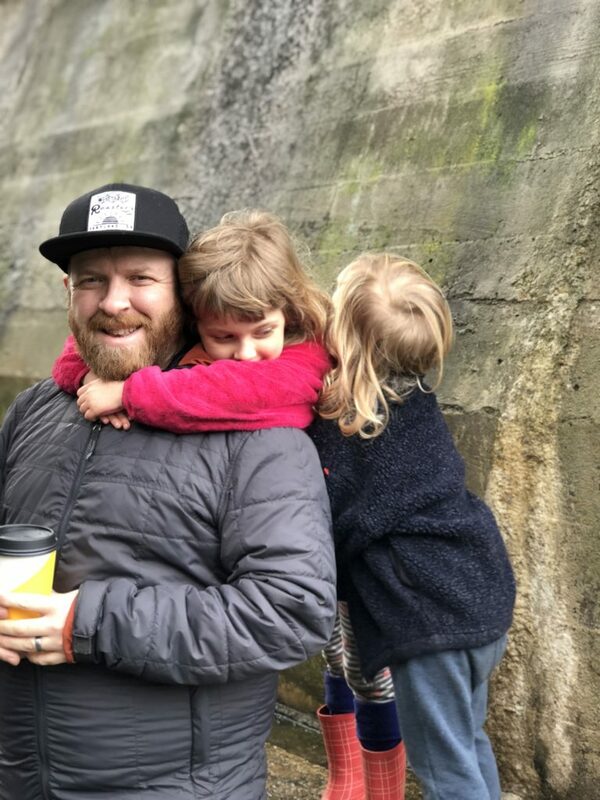 Summer and her two children have created a beautiful Instagram and website filled with book reviews that really dive into what the book is about and why you should add it to your reading list. 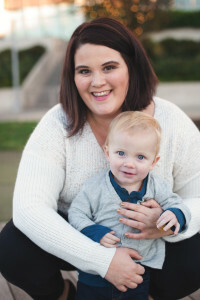 She has also created an inventory of book lists based around topics and themes that will satisfy your little and big readers. @the_reading_doctor | The Reading Doctor. Regular prescriptions of the best in children’s books. The Reading Doctor is a newer account and a recent find of mine and it is quickly becoming an obsession of mine. The Doctor is handing out prescriptions for books to cure everything from learning to let go, to feeling empowered and even for mums! What could you or your little one use a prescription for? Have you ever been curious what is behind those beautiful book covers? Little Books Big World is serving up not only amazing book reviews/features but also a glimpse into the book which is so helpful when it comes to buying/borrowing books. I love “flipping” through the pages while I add yet another book to our ever growing book list. @ourbookbag | By Carie Helm Sharing children’s books we love and explorations at our local library. Vancouver, BC. 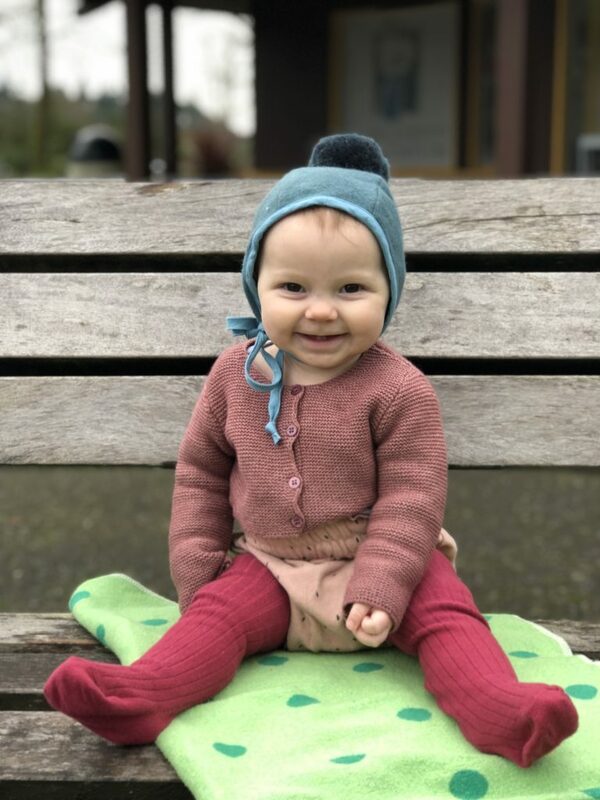 Carie has carefully curated an Instagram account that will have you excited to take your little ones to the library and stock up on all the books. Her reviews provide a little sneak peek into the books with a dash of her own experiences, a glimpse at where they life and links to other resources to keep your feed filled with books. Before kids, Neil and I spent most of our free time traveling. We visited spots from Toronto to Halifax, from Maine to Florida and took ourselves on a tropical cruise. When we decided to have kids wanted to make travel a priority for our family. Whether it’s traveling abroad or a trip an hour away we want to explore the world with our kids. 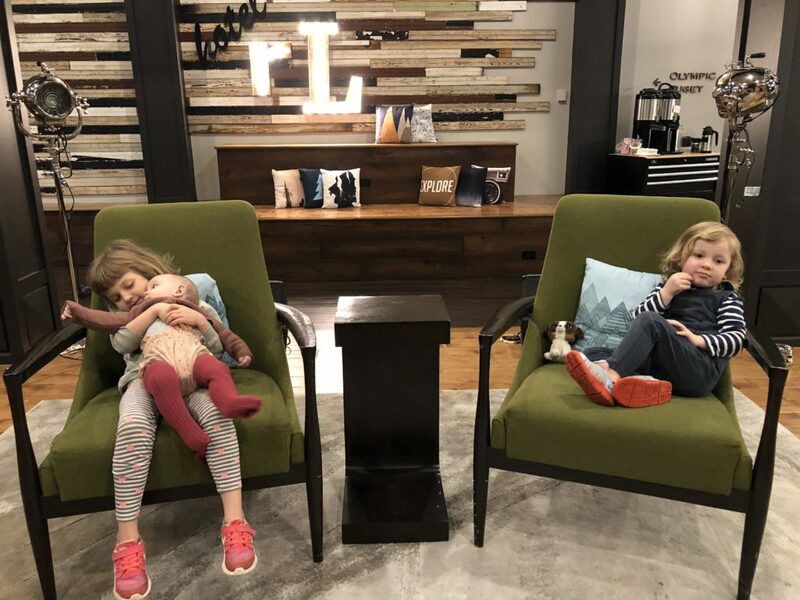 While traveling with kids can be a bit challenging, frustrating at times and far from relaxing it is pretty special. 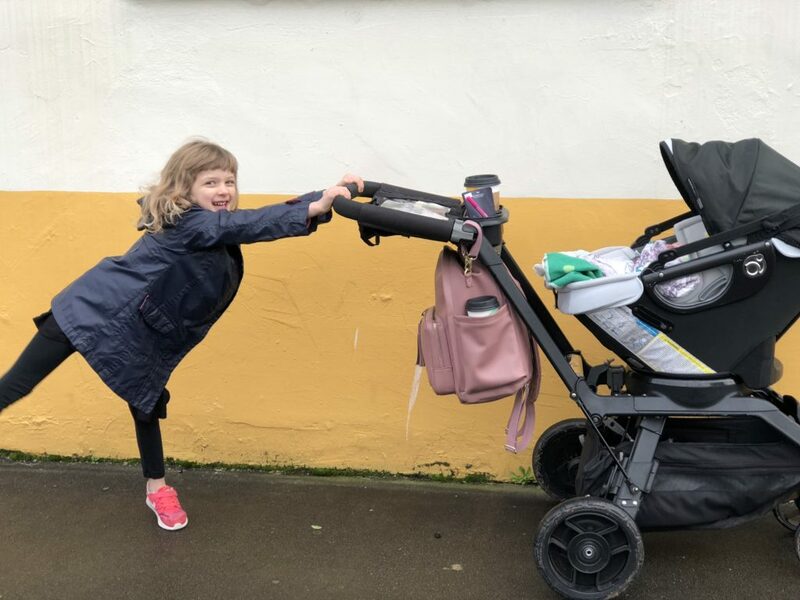 We recently traveled to the Washington Coast for Neil’s birthday and it got me thinking about what pearls of wisdom I could share with other parents looking to travel more with their childrene We’ve decided to start a new series: Ingalweathers Do Travel. The series will feature our travels near and far and tips and tricks for traveling with young kids. We aren’t experts and are constantly learning so we hope you’ll share your tips and stories in the comments below. Our first trip of 2018 was our annual night away to celebrate Neil’s birthday. 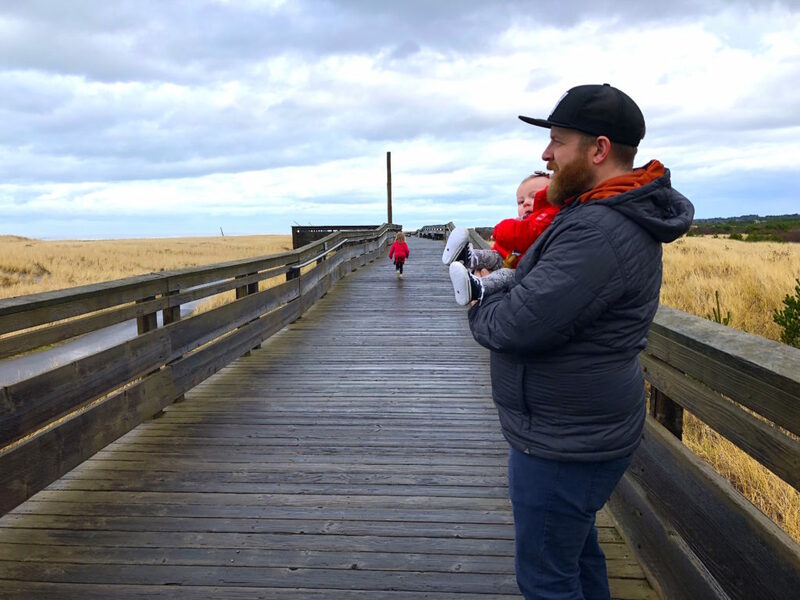 To celebrate, we decided to travel to what has become one of our favorite getaway spots, Astoria and the Long Beach Peninsula. We took our first trip to the area in March 2013, shortly after moving to Portland. It’s continued to be one we’ve taken two to three times a year. We have the ocean, great restaurants, family-friendly activities and a great little port city to wander around. 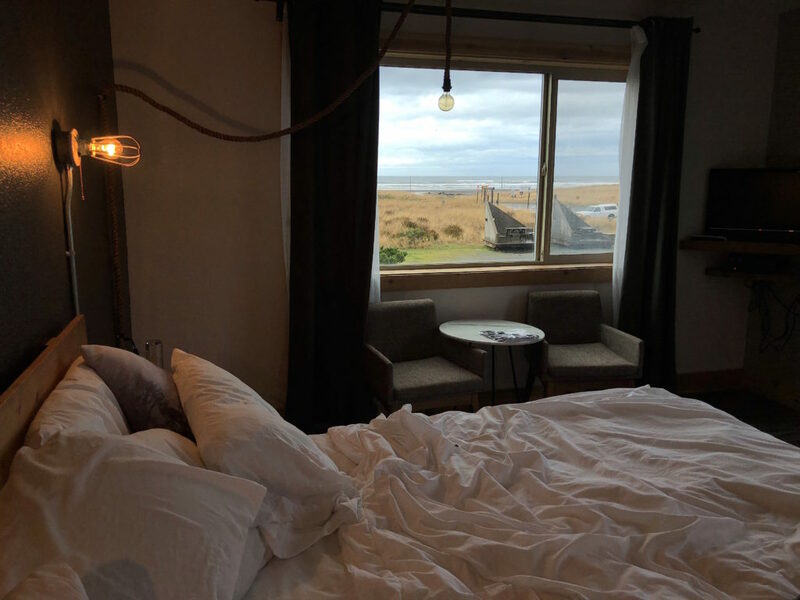 For our night away we stayed at the Adrift Hotel on the Long Beach Peninsula. This hotel is just steps from the ocean with access to a great beach (be aware that the beach is open to vehicles during the off-season). 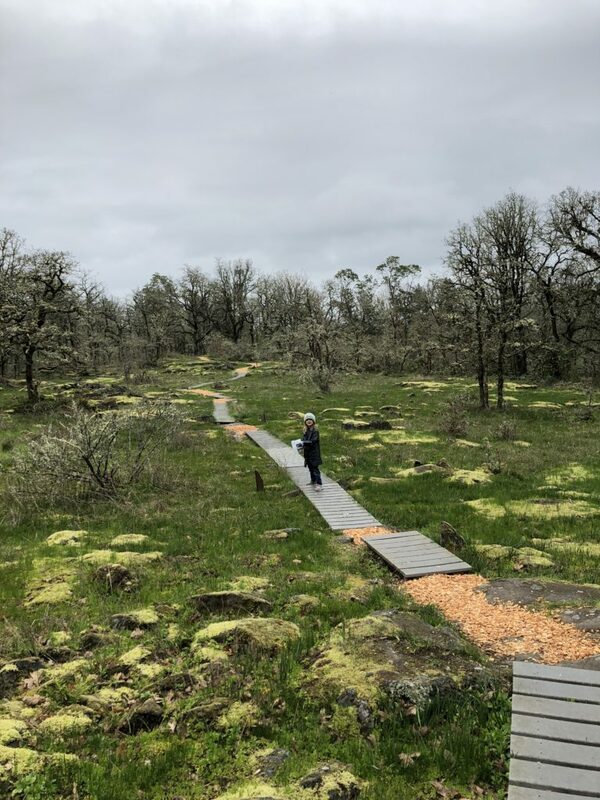 At the beach, you can get access the Discovery Trail, 8 miles of bike path that runs along the beach from Cape Disappointment to the Lewis and Clark Carved tree in long beach. 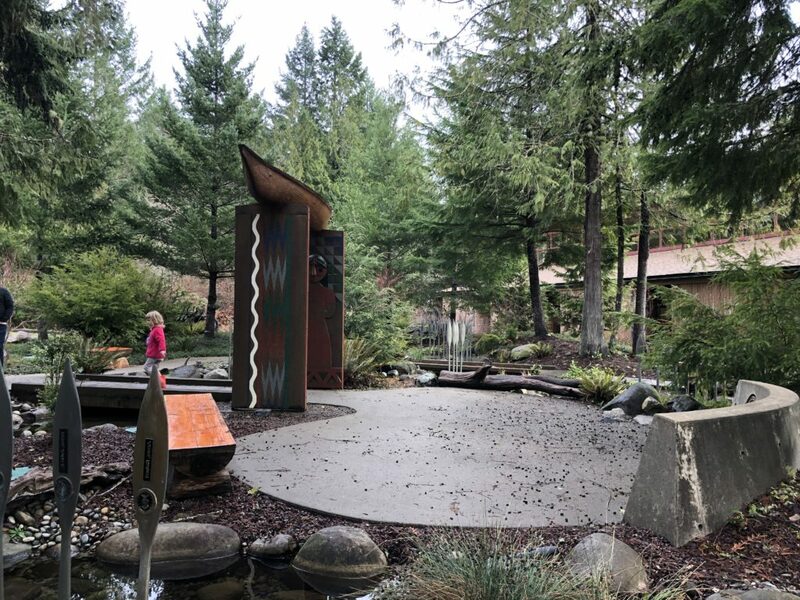 It’s a great spot to borrow one of the Adrift’s bikes or bring your own (especially if you have little ones) and spend the afternoon riding the trail. That Adrift is a fun spot for the whole family as well. 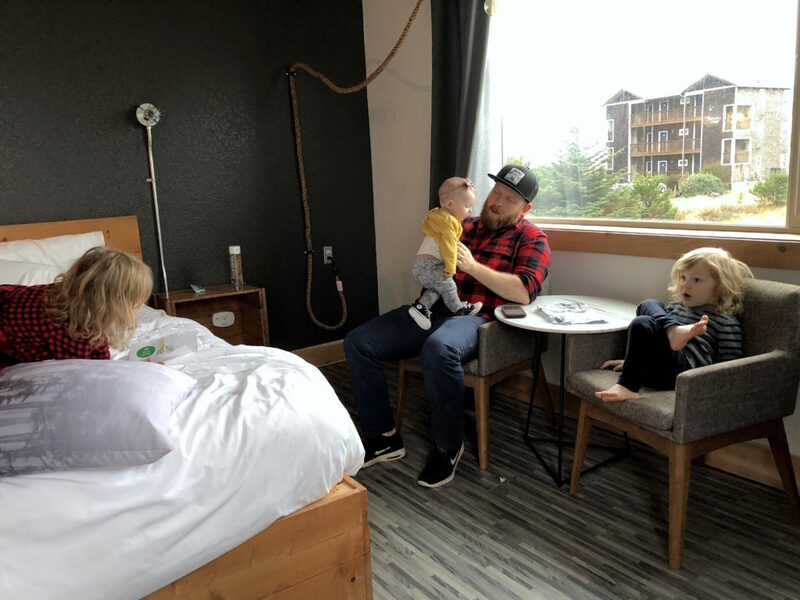 Besides the beach, families will love the suite and bunk rooms, game area (our kids had a blast playing foosball and pingpong), family friendly restaurant and a stock of family friendly games and movies for you to bring back to your room. It was also stocked with the best snacks and drinks I have ever found at a hotel. They had a wide selection of local spa products, snacks, beer and wine from places like Fort George and Buoy beer in Astoria. After picking up some snacks, the kids picked out Candyland for our evening entertainment back in the room. 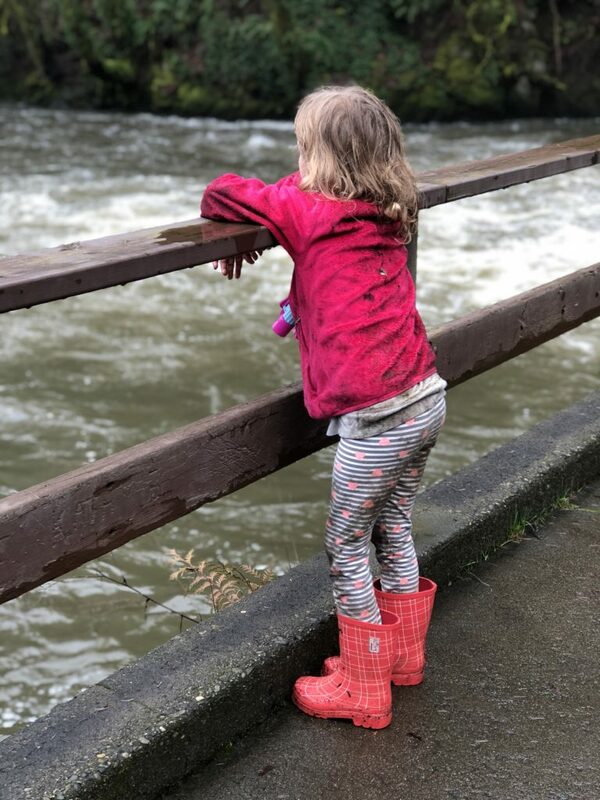 Of course being winter in Oregon, our trip was filled with rain but we didn’t let that didn’t get us down. We skipped playtime at the beach, promising that we would stop at another beach before we headed home. So we avoided the rain and the wind and opted for breakfast at the hotel. After our bellies were filled we packed up and headed to Astoria for the day. 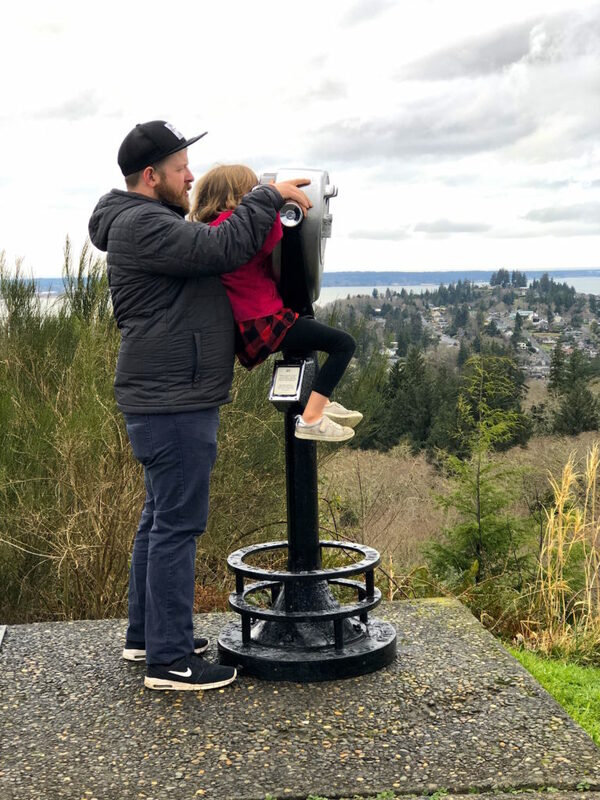 We got a break from the rain so we quickly stopped at Street 14 to pick up coffees and our favorite pumpkin bites and headed up the steep Astoria hills to the Astoria Column. This wasn’t our first visit to the column, but I think it was the first time Edith really remembered it. Ingrid had fallen asleep so I used that as an excuse to skip the trek up the winding staircase to the top of the column, staying in the car at the bottom and watch Edith’s little wooden airplane fly down (insider tip: head to the gift shop and pick up a little airplane to fly off the top. Your kids will love it!). 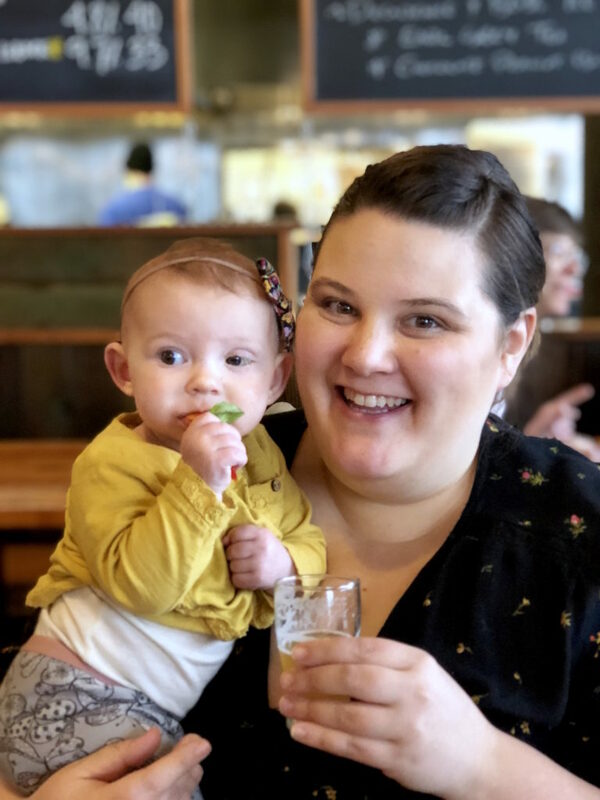 After our trip to the column we headed back down the steep hill and made our way to our favorite Astoria restaurant, Buoy Brewing. 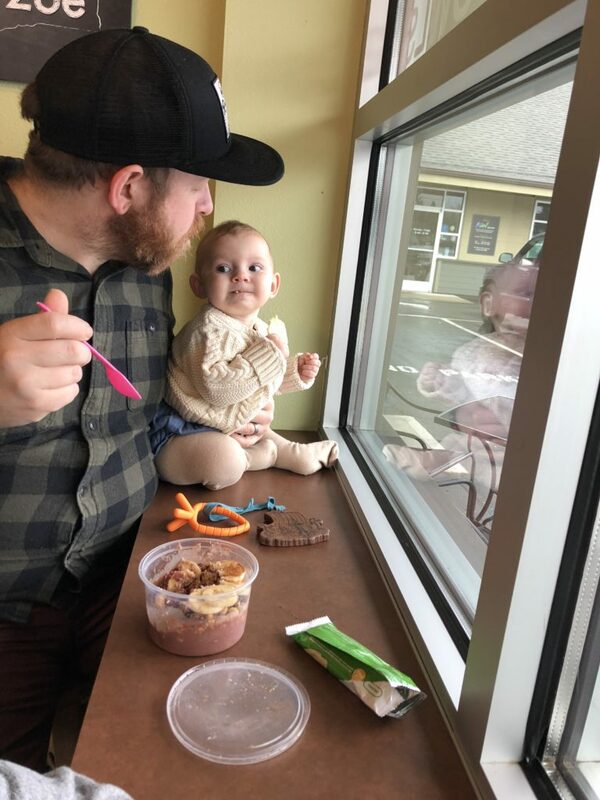 Our first trip was as a family of three the first week they opened and it has only gotten better and better over the years. 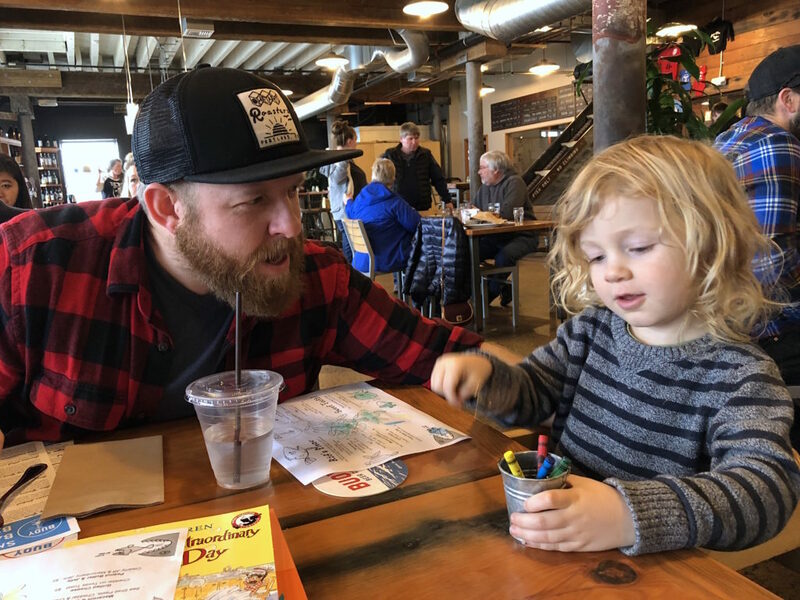 This is also a spot that our kids will request going to at least once per month because in the floor of the restaurant, which is located on the wharf, there is a big glass window where a sea lion (or 2) can be found resting. Am I lame to say that my favorite thing to eat at Buoy is the salad? I am going to anyways because their vinaigrette and salad is just so good (the veggie burger comes in a close second). After our trip to Buoy the rain started up again as we started to head toward home. BUT WHAT ABOUT THE BEACH? 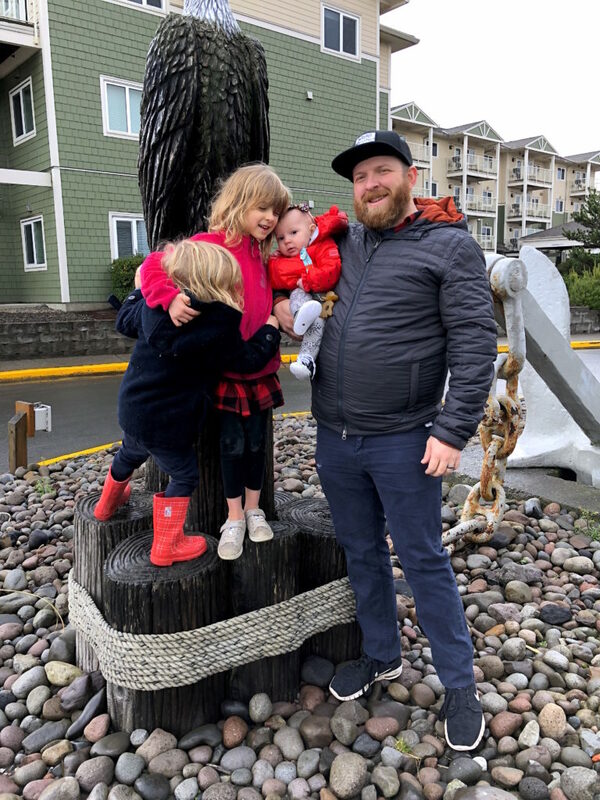 Well Neil and I decided to give the kids an option – we could stop at the merry-go-round in Seaside or we could stop for a quick, wet and windy beach stop. To our surprise (and luck) they chose the merry-go-round and to their luck the gentleman running the merry-go-round gave them an extra ride. While the big kids rode the merry-go-round we sat in the car and found new fascinating treasures. 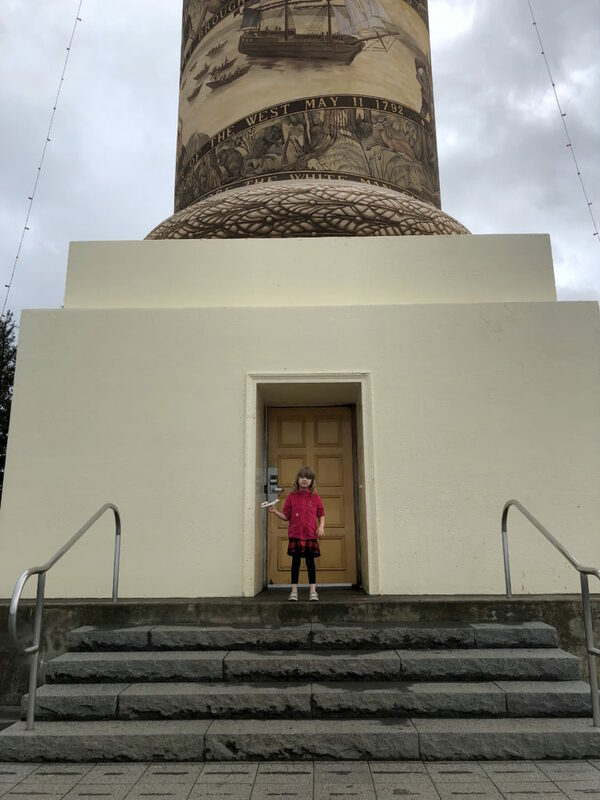 While the big kids rode the merry-go-round we sat in the car and found new fascinating treasures.With that we finished our quick night away and headed back to Portland with a quick stop of birthday pizza and ice cream. Happy Holidays! I will be taking a short break from blogging for the holidays. I’ll be back in the new year with a ton of new content that I have been working on behind the scenes. I plan to be back January 2nd but until then you can find me on Instagram. 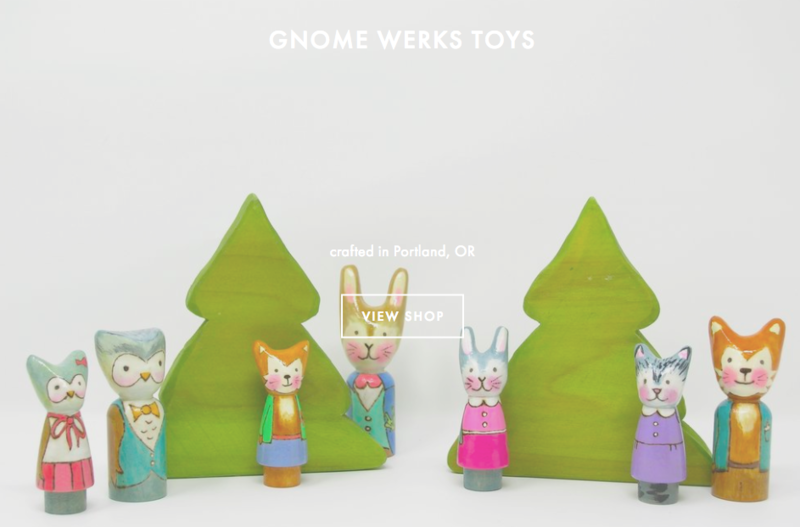 Gnome Werks Toys | The most beautiful wooden toys for your little one. Toys are inspired by children’s literature, and fairy tales. you’ll find gnomes, fairies, scientists, pirates, mermaids, and more along with a beautiful holiday collection. 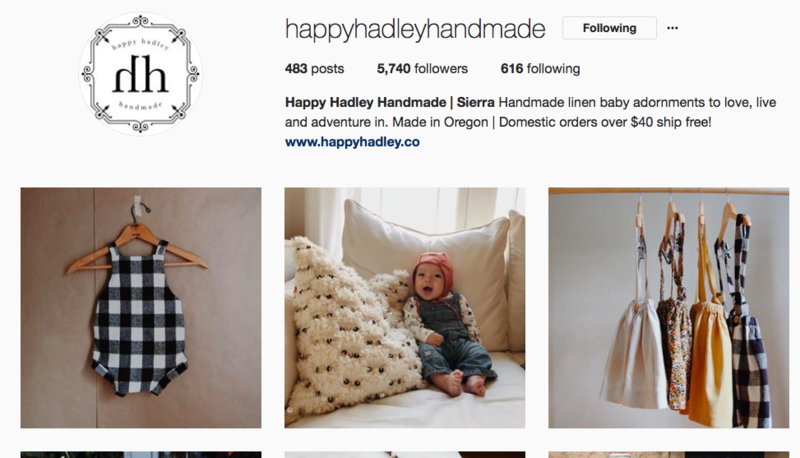 Happy Hadley Handmade | Beautiful, handmade linen items for babies and children. Usborne Books | I will shamelessly share my own business because I love Usborne Books. I joined Usborne 15 months ago because I fell in love with the books after hosting a party for a friend. These books are interesting, interactive, and some of my kids absolute favorites – see some suggestions here or message me for ideas. 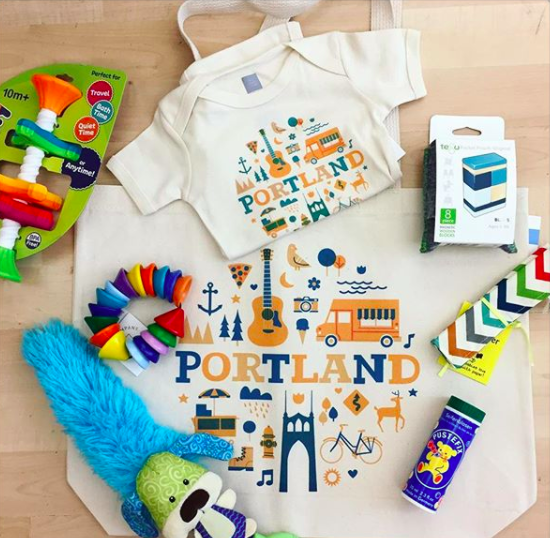 What are your favorite small shops in Portland and/or online? This post is NOT sponsored however it does contain an affiliate link. Purchases you make through these links will help fund the work I do here on Naturally Family at no extra cost to you. Thank you sincerely for your constant support. When it comes to toy gifts I am incredibly picky. I don’t want a ton of plastic toys around the house (although we some how have a lot) so I lean towards wooden toys for the most part. 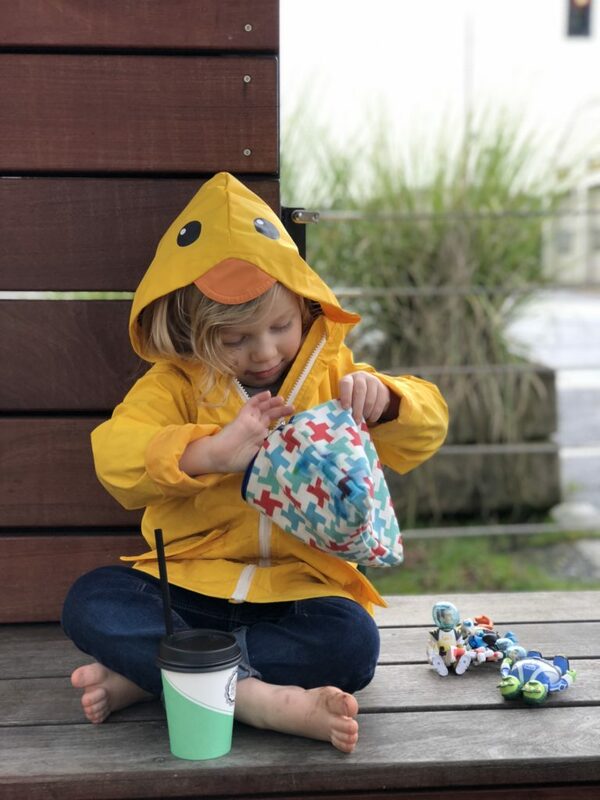 I also like things that have cases because I love to organize toys and because our kids always want to bring toys with them I love toys that are easily transportable. Most of all I want something that I feel adds value, can withstand years of three children playing with it and not too many small parts. 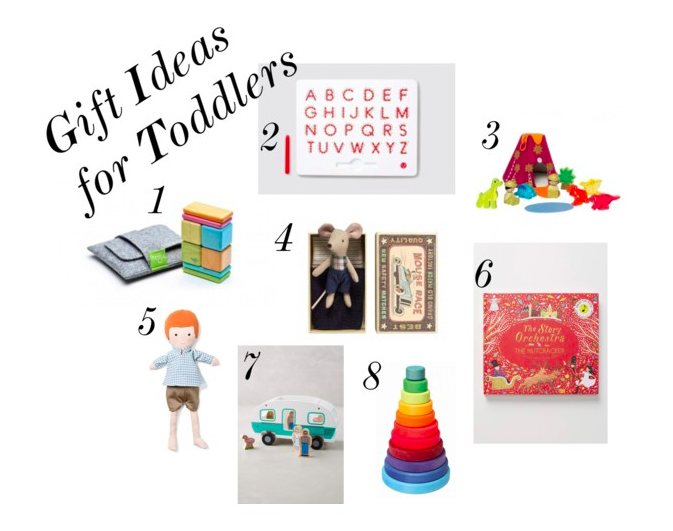 Honestly our kids don’t need new toys but the thing is they are going to want something and/or someone is going to want to buy them some so why not create a list with toys that fit your families wants. Here are few that are either on our wish-list or that we already own and love. Tegu 8- Piece Pocket Pouch – I have had my eye on this set for years now. I see this as something that would be great for traveling, keeping busy at a restaurant or simply something to play at home. 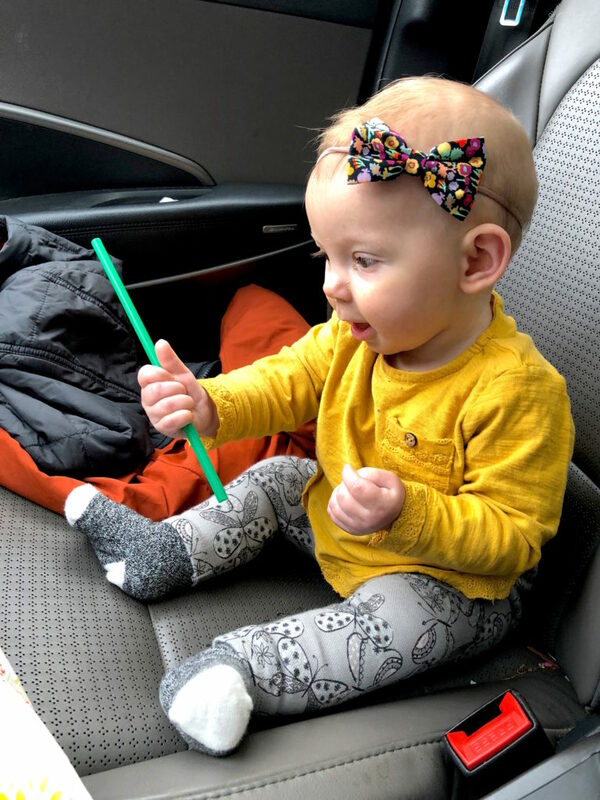 Kid o A to Z Upper Case Magna Tab – This is on my wish-list for my kids because it is again a great travel item but also such a great way for them to learn their letters and how to write. I picked up the number version at a second hand shop a few years ago and it is still loved by both Edith and Alder. Jurassic Adventure Wooden Playset – This is something that I think Alder would go wild over. 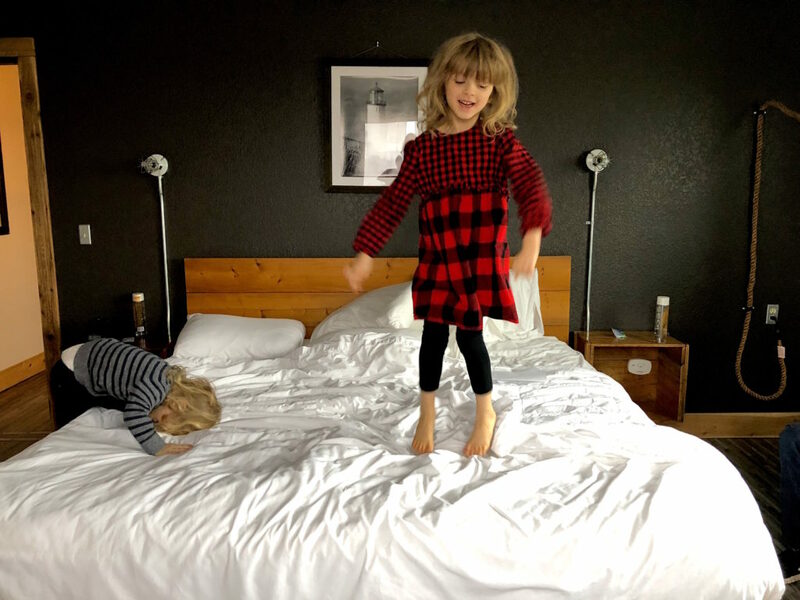 While Edith would prefer to create art, Alder is all about the imaginative play. We bought him this firehouse last Christmas and he has spent countless hours playing with it along with our Fisher Price town from my childhood. So long story short I think that this is another playset that would be perfect for little ones who love dinosaurs and/or love imaginative play. Maileg Mouse Plush Toy – This is one of those completely frivolous toys that no child actually needs but I as a parent have fallen in love. I tried to convince Neil to get one for Edith for the past three years. This year I am trying to convince him to get the big sister, little brother and little sister mice but honestly I think that this is one battle I won’t win (this year at least). 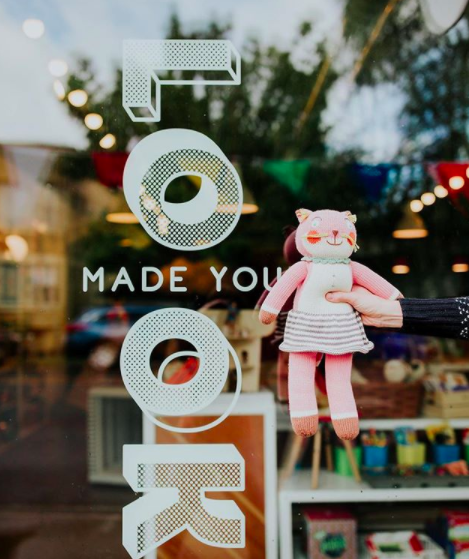 Nonetheless these toys are beautiful and are something your little one will likely keep into adulthood and possibly parenthood should they choose. Hazel Village Doll – In recent years both of my kids have really gotten into dolls. Again I am not huge on plastic dolls and such so when I found these beautiful plush dolls I fell straight in love. They have so many different styles and looks so there is bound to be one you fall in love with as well. The Story Orchestra: Nutcracker – This beautiful book includes the music from The Nutcracker. Magnetic Camper Toy – This basically has everything that I love in a toy. Magnetic so the smaller pieces stay with it. Everything can pile into the camper for storage. It’s wooden and it travels easily. Grimm’s Rainbow Stacker – Stacking toys have been a favorite of all my children (I assume Ingrid will love them as well) and this one is high on my wish-list for her. It’s beautifully made and heirloom quality so it is something that we will be able to use for years and pass on later if we so wish.